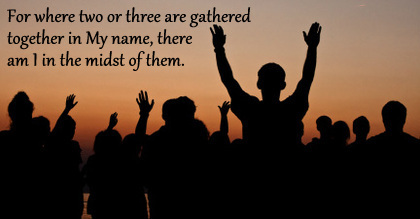 There is almost nothing that makes me feel a part of the Body like group prayer. But I didn’t grow up in a fellowship that encouraged group prayer, especially not for girls. Prayer was a solo event led by a man, that opened and closed the service, and bookended communion. Prayers contained the same phrases, over and over again, the same endings, over and over again. It seemed meaningless. And boring: there were the endless chain prayers at summer camp that only males were allowed to participate in. In short, I never learned how to pray. Even with my parents, before bed at night, I never prayed. Instead, they prayed over me. I wondered if something was wrong with me. I could hear my younger sisters pray out loud with them before bed, so why couldn’t I?? I was an adult by the time I started learning how to pray out loud. I fell into ministry when I was only 19 years old, and it seemed everyone assumed I already knew how to pray out loud. In group settings where I was asked to pray, I was scared to death. I never knew what to pray: I was afraid I would make a mistake, or worse, not be able to get any words out at all. I was a foreigner to the culture of group prayer, and it took me years to acculturate. I took huge steps toward that aim as a brand new mom, when I attended a weekly ladies’ Bible study/prayer group. We shared our praises and requests, then prayed popcorn-style as a group. And though I prayed aloud, I always had this queasy, uneasy feeling in my stomach both while preparing to pray, and while praying. But I’m incredibly thankful for that time, a time when older, more mature women taught me about grace, and faith, and perseverance, and when I learned from them how to talk to God. Praying in front of people is an act of vulnerability. People might be able to see what’s buried deep inside, and that’s scary. Praying with other people is also an act of releasing control. We can’t control how long someone is going to pray, we can’t control who cries, or laughs, or shouts. And that’s sort of scary too. Since beginning the application process with Team Expansion, I’ve been surrounded by people in the missions movement who are passionate about prayer for unreached people groups, and who pray aloud, together, much more regularly than I was used to. Prayer was modeled for me, first by Team Expansion’s office staff, and later by missionaries on the field here in Cambodia. It has been a privilege and a blessing to learn from other, more experienced pray-ers. I’ve learned the kind of prayers that are in line with the heart of God, and I’ve become bolder in the asking. I still don’t know much about prayer. But I have learned how to pray confidently in groups, and how to pray for something else besides my own needs — whether those needs be calculus tests or Cambodian power outages. I don’t always know what I’m going to pray when I gather with other believers, either, but somehow being together helps my words to flow more easily, creating a prayer that wasn’t there just minutes before. In the four months since we’ve returned from furlough, I’ve had more opportunities than usual to pray with others in group settings. And I am no longer fearful of it. On the contrary, I actually crave group prayer now. I’m not just ok with it, I love it. Even when I’m praying the same things with other people that I would pray on my own, there is just something different about praying together. this sounds gender-specific in your background in the sense that multiple contexts deliberately exclude females (in favor of male only). It was when our family moved to a Southern Baptist Church that mentors demonstrated by their lives how to pray aloud in a group. Of course these, too, were all males (as I recall). Now I am married to a Presbyterian pastor who was ordained in 1980 and has been leading churches since then. Wow, this post just reminded me that I didn’t learn how to pray out loud until I was a senior in college, despite having grown up as a pastor’s kid and missionary kid. And now I remember very clearly the situation that pushed me out of my comfort zone and also how much more I connected to God once I started praying out loud in groups. I don’t think I’ve thought of that in years, so thank you for the memory jog. It’s fun to see how I’ve grown over the years in prayer, but I also thank you for the reminder to continue to pursue it fervently.